We were launching our Rockets. Our group name is Blasting Rockets. Our angles are 20 degrees and 25 degrees so our averages were of course, 20 and 25 degrees. The group with the lowest-launching rocket (which is our group) got 20 degrees and 25 degrees. The highest-launching rocket (which is group J.E.X.L.) got 44 degrees, 43 degrees and 53 degrees.The averages are 44 and 53 degrees. There were 3 other groups which are Rocketeers, LASA, and finally, Science Minds. Their averages were 44 degrees and 46 degrees, 31 degrees and 35 degrees and 43 degrees and 47 degrees. If you saw our rocket when we launched it, it did not go very high but actually pretty low. Before we launched our rocket, the people who had trundle wheels as a job would use the trundle wheels to measure 50 meters out and the people with clinometers would measure with the clinometers. I was really jealous of the of the other group. There rockets went really high. Our rocket was not that good. It was because of the wings . It had three wings on the bottom and two on the top. It wasn’t balenced. That is why it went to the side. Our rocket had a design. It was red white and blue. Of course those are the american colors. Another group called Peter POKER put a little smurf and wanted him to go to the moon. They called him peter Poker. They named him that because they thought how both of the words start with p. There were many more designs and it was a very good experience. I wonder what we can do to make the rocket go highher. 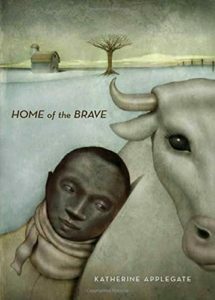 Gol is a cow, but Katherine Applegate (author of HOME of The BRAVE) also uses her as a symbol. How does Gol represent Kek’s past, present, and possibly his future? Gol represents Kek’s past by reminding how he herded cows. Gol is his present because it calms him down when he thinks about his past. Gol represents his future because gol is going to a new place where he is going to be happier. I am looking forward to having a lot of fun. I think our rocket will be a success. We did lots of learning about rockets and got lots of information in our notebooks. I think we will finish our rocket in time. Our Logo that my group will draw with me is a lightning bolt. Our group name is the blasting rockets. We made our logo a lightning bolt because we wanted our rocket to go as fast as a lightning bolt. I am very confident. We also studied Isaac newton and his laws of motion and I related the first law of motion to rocketry.